As iconic as there ever is in the hobby. An instantly recognized and hotly desired relic which sets the bar among key scarcities. One of only ~100 or so copies believed to exist and only the 3rd example we've had the pleasure of brokering in our long history. 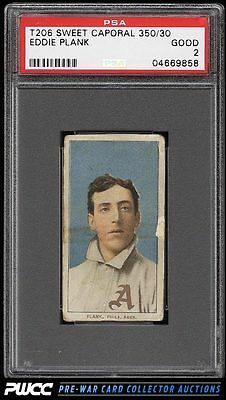 Offered here is a wonderfully preserved card for the grade, entirely void of major creases and submits only moderate corner rounding compared to most. A bit of stock loss and a subtle rubber band mark across the middle are perhaps all that prevented a higher technical assessment. Even still, it's hard to imagine a better '2' anywhere in the hobby. We can't recommend this card highly enough. Part of an impressive run of ever popular T206 White Borders on the auction block. In total well over 500 examples are displayed, which represents the majority of an entire set. One of nearly 20,000 cards, lots, and sets up for bid in our 7th Auction of 2016. Click on the link above to view the other PWCC auction lots.